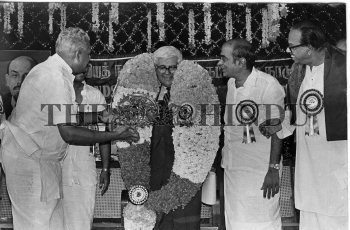 Caption : The AICC(I) General Secretary, Mr. G.K.Moopanar presenting a panchaloha idol of Lord Nataraja to the Soviet vice-president, Mr. S.B.Tatliev when the latter inaugurated the Tamil Nadu branch of Friends of Soviet Union in Chennai, the Capital of the southern Indian State of Tamil Nadu. Mr. S.R.Balasubramaniam, chairman of FSU, Tamil Nadu (third from left) and Finance Minister, V.R. Nedunchezhian are all smiles about the giant-sized garland around the neck of Mr.Tatliev.